The White House has accused Damascus of using chemical weapons on the eve of G8 summit, at which Western leaders led by the US president will attempt to urge Vladimir Putin to desist from support for the Syrian president. On June 14, the White House announced that it possesses evidence of the use of chemical weapons by the Syrian army and, based upon this, is now ready to begin supplying arms to the opposition forces in Syria. The United States took this step on the eve of the meeting of G8 leaders, at which Western leaders led by the U.S. president will attempt to urge Vladimir Putin to desist from support for the Syrian president. Rhodes said that between 100 and 150 people died in these incidents. “The president has said that the use of chemical weapons would change his calculus, and it has,” said Rhodes. In connection with this, Obama, according to the Washington official, has resolved to offer assistance to the Syrian opposition, which will now include “military aid.” However, Rhodes did not elaborate upon the practical aspects of this aid. Readers are reminded that, three weeks ago, the EU did not renew its moratorium on arms sales to Syria – a fact that permits the U.K. and France, which ratified this decision, to commence similar military support to the opposition. Alongside this, Washington, Paris and London have meantime remained tight-lipped on the issue of the timing and nomenclature of such deliveries. The problem, though, is not in the military aid. The opposition rebels have not been slugging it out with the Syrian army regulars for over two years with bare knuckles alone. Qatar alone has provided total aid exceeding $1 billion dollars, according to reports in the media. 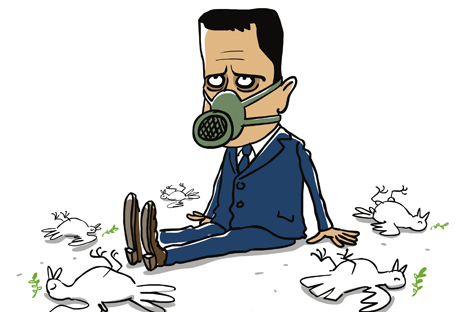 The problem is this: Is the Assad regime using weapons of mass destruction and, in particular, chemical weapons? Such a step would be unacceptable in the modern world, where weapons of mass destruction are, primarily, a deterrent. This would certainly be a “red line,” and crossing it would make Assad into an international pariah. Moscow believes that the accusations against Damascus are unfounded. The foreign affairs assistant to the Russian president, Yuri Ushakov, made a statement to reporters on Friday. “I want to confirm that we have held meetings with the U.S. representatives, during which the Americans made their case over the Assad regime's use of chemical weapons. However, I would say frankly that the American case does not appear credible,” he said. Ushakov reminded journalists that, before their commencement of hostilities in Iraq, U.S. Secretary of State Colin Powell displayed a test-tube of a white substance at the U.N., which he alleged Saddam Hussein was ready to use at any moment. Yet the U.S. has never uncovered the slightest evidence of the existence of WMD in Iraq. As a matter of fact, Washington's statement laid out the principle topic of the G8 summit, which takes place over June 17-18 in Northern Ireland, as well as the agenda of the meeting of Putin and Obama, which is due to take place “in the wings” of the summit. U.S. Ambassador Michael McFaul met journalists on June 13. “When our two presidents meet in a few days’ time, [Syria's deployment of chemical weapons] will be one of the key issues on the table,” said the ambassador. Yet McFaul believes that the interests of Washington and Moscow coincide on this matter. “When Secretary of State John Kerry came to Moscow, he made it very clear that we want to work closely with Russia in the battle with our common foes – and not against Russia,” he said. Moscow opposes the use of chemical weapons, no matter who is behind it. Cooperation between the two powers on this matter is a key element in the entire raft of international relations. The Kremlin has continuously stressed its willingness for equally shared cooperation with the U.S. on global issues. It therefore seems possible that Putin is suggesting the possibility of a position change on Syria, in which he can cease support for Assad without losing face. Yet, judging by Ushakov's statements, the Kremlin boss is not inclined toward such a step and remains firm in his opposition to meddling foreign powers aiming at regime change. There is an alternative – military aid to the opposition which would feature not only the supply of weaponry and informational support, but also the introduction of a no-fly zone. The Wall Street Journal referred to this on Friday, citing a source within the American military. Such measures could eat away at the military superiority the Syrian government troops currently enjoy, altering the balance of power on the eve of the World Conference on Syria that is to be held in Geneva and is being promoted by the U.S. and Russia. Moreover, the very fact of incipient outside interference in the Syrian crisis casts a cloud over its actual implementation. “This isn't curtains for Geneva-Two,” said Fyodor Lukyanov, chairman of Russian NGO Council for Foreign and Defense Policy (CFDP). “Mr. Obama has long been under intense pressure, but he fails to act – and meanwhile people have been talking about the provision of military assistance for a long time. “This will result in the next step, which is the end of all peace efforts” the CFDP chairman said.